H.A.A.R.P. (High Frequency Active Auroral Research Program) is a scientific research facility, located near Gakona, in the remote Alaskan outback and is a joint Navy and Air Force project. This facility is used to study the earth's Ionosphere, the electrically-charged belt surrounding our planet's upper atmosphere, ranging between 40 to 60 miles from its surface. More specifically, H.A.A.R.P. is a controversial high frequency radio transmitter, or "ionospheric heater". The military intends to use this billion-watt pulsed radio beam in our upper atmosphere, which will create extremely low frequency waves, or ELF waves. This technology will enhance communications with submarines and will allow us to "see" into the Earth, detecting anything from oil reserves to hidden underground military targets. H.A.A.R.P. 's roots can be traced back to work of Nikola Tesla, a Yugoslavian scientist, who's achievements include the Tesla Coil or "magnifying transmitter" which is still used in televisions and radio today. Holes in Heaven is a prime example of grassroots film making by producer Paula Randol-Smith and Emmy-winning director Wendy Robbins. Narrated by Martin Sheen, the film, investigates HAARP, its history and implications, and examines the dangers and benefits of high and low frequencies and of electromagnetic technology. Among the many scientists interviewed are Dr. Bernard Eastlund, whose original patents are the reputed blueprints for HAARP, Project Director Dr. John Heckscher, and Dr. Nick Begich and Jeane Manning authors of Angeles Don't Play This HAARP. 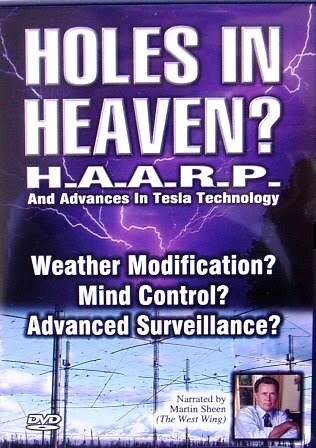 Holes in Heaven strives to give a fair and accurate appraisal of HAARP, and brings before the public, vital information about a project which could have a dramatic effect upon our entire world.